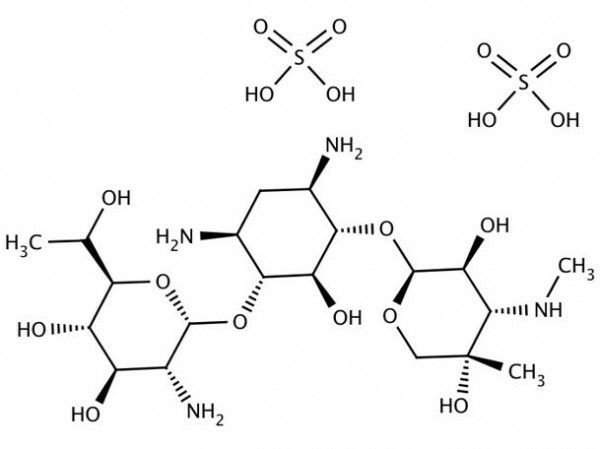 Product information "Geneticin (G418) - 50mg/mL"
Geneticin, often also called G418, is an aminoglycoside antibiotic that inhibits protein synthesis in mammalian cells by interfering with ribosomal function. Geneticin (G418) shows a structure similar to gentamycin and kanamycin and finds application in the selection of stably transformed cells expressing the neomycin resistance gene (aminoglycoside) of transposons Tn 5 or Tn 601. Because G418 (Geneticin) is toxic for many cells, the optimum concentration for each cell type has to be determined. It is usually between 50ug/mL and 1000μg/mL. At a concentration of 500μg/mL, for example, 70% of HepG2 cells are killed after incubation for one week and 100% will stop their growth. Since potency of the antibiotic can vary from batch to batch, it is recommended to create large stocks of a batch tested to standardize the system. Cells divide still once or twice in the presence of the lethal dose of G418 (Geneticin), so that a selection effect will be visible only after several days. Geneticin is a registered trademark of Gibco, a Division of Life Technologies. Genaxxon bioscience offers a broad range of Antibiotics and Antimycotics as powder or solutions. More products around "Geneticin (G418) - 50mg/mL"
Our comment on "Geneticin (G418) - 50mg/mL"
Here you will find information and further literature on Geneticin (G418) - 50mg/mL. For further documents (certificates with additional lot numbers, safety data sheets in other languages, further product information) please contact Genaxxon biosience at: info@genaxxon.com or phone: +49 731 3608 123. Customer evaluation for "Geneticin (G418) - 50mg/mL"